Options Tooth Wipes - 25 ct.
Earthbath Tooth and Gum Wipes are the easy and convenient solution to keeping your pet's mouth clean from plaque, tartar and odor-causing bacteria. Our totally natural formula is free of parabens, alcohol, and other nasties that don't belong in your pet's mouth. Use daily for best results. 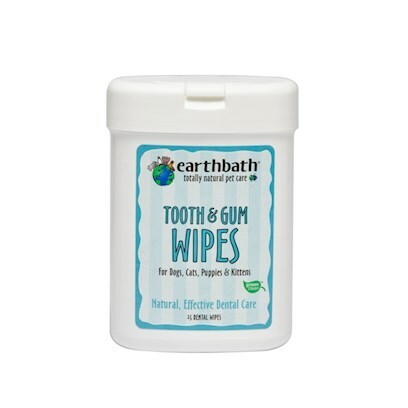 Earthbath tooth and gum wipes do not contain anything that would harm you, your pet, or the planet. This product contains no: parabens, phosphates, pthalates, DEA, synthetic dyes or perfumes. Any residue left behind is completely safe and will not harm your pet. Water, Polysorbate 20, Glycerin, Mentha Piperita (Peppermint) Oil, Sodium Bicarbonate (Baking Soda), Phenoxyethanol, Caprylyl Glyco.